SARIN nerve gas stands for Schrader, Ambros, Rüdiger and Van der Linde, its discoverers. If we have been surprised to learn that a notorious and important Japanese fascist, Nobusuke Kishi, was little punished for his crimes, and is the grandfather of current Japanese PM Shinzo Abe (http://en.wikipedia.org/wiki/Nobusuke_Kishi), we are more shocked that those closely involved in Nazi crimes were little punished and sometimes walked free. While many common folk in Germany, especially those still children, or not yet born in the Nazi era, have engaged in self-flagellation over the crimes of the Third Reich, real criminals involved with the regime have walked free and prospered. 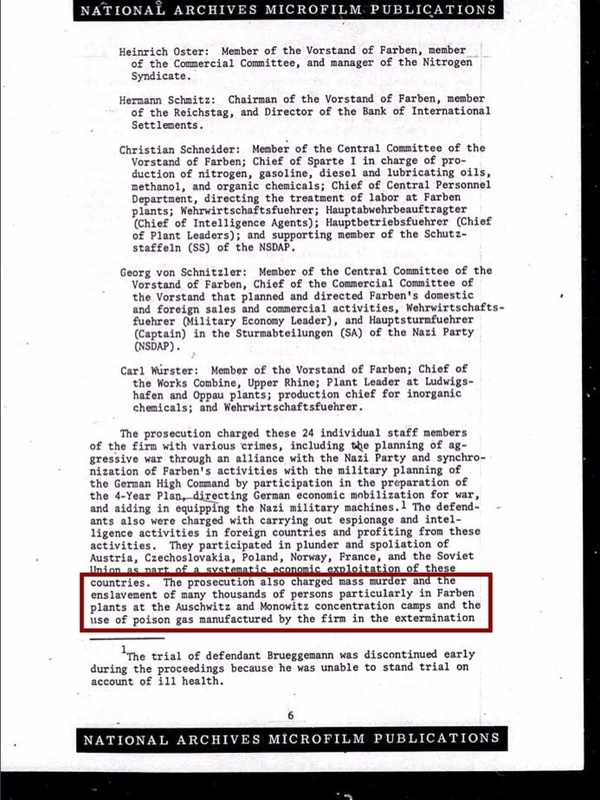 Were they set free in order to obtain the formulas of these chemical weapons? Or was there another reason? Clearly the world lives in more than the long shadow of Nazi Germany. We live with the same corporations, the same mentality, we live with the legacy of chemical weapons, nuclear energy, and nuclear missiles and more. It seems that the Allies lost the war, not only in Japan, but also in Germany. Is that why Obama is trying to import German nuclear waste to dump on America? 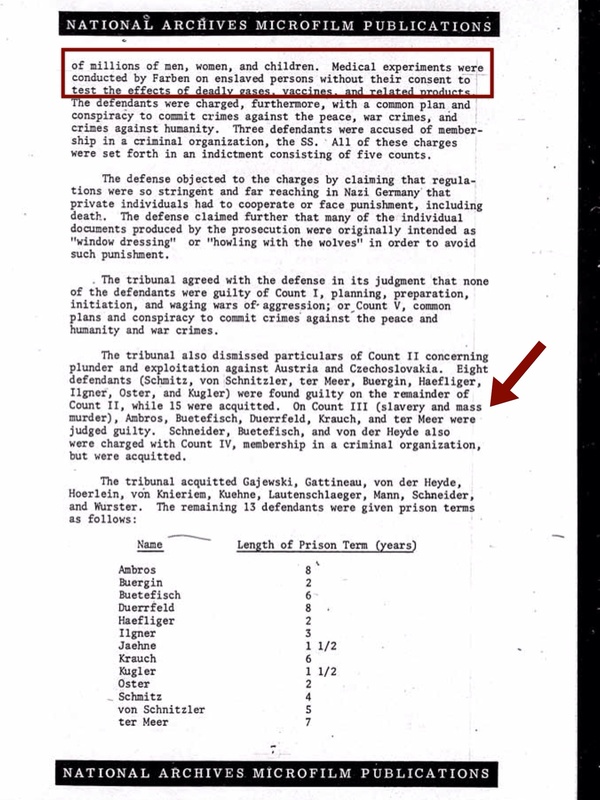 (Emphasis added) Schrader seems not to have even been prosecuted for war crimes! More on him further down. “=> IG FARBEN was closely involved in the war of conquest of the Third Reich. The company followed the armed forces into the conquered countries of Europe and took over considerable parts of the chemical industry there within a few weeks. It also took coal mines and oil production. The later Chairman of the BAYER Board of Management, Kurt Hansen, played a leading role in these robberies. — Why, three months ago, in November 2006, did the modern Bayer Corporation place a wreath from the “Bayer Board of Trustees and Supervisory Board” at the grave site of convicted Nuremberg war criminal Fritz ter Meer? “Fritz ter Meer (July 4, 1884 – October 27, 1967) was a German chemist and Nazi war criminal. From 1925 to 1945 Fritz ter Meer was on the board of IG Farben AG. 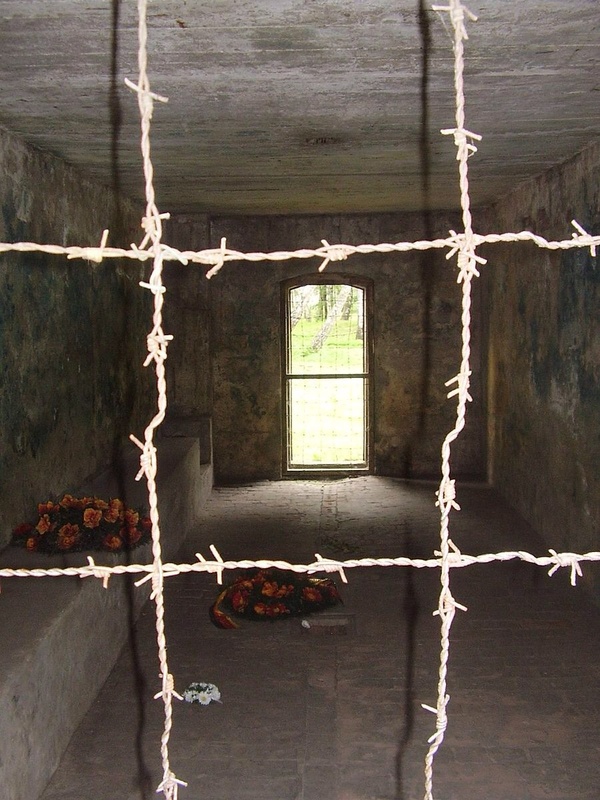 He was involved in the planning of Monowitz concentration camp, a satellite camp of KZ Auschwitz. Fritz ter Meer was sentenced to seven years in prison in the Nuremberg Trials in 1948. After he was released in 1951 he became upervisory board chairman (Aufsichtsratsvorsitzender) of Bayer AG. “Otto Ambros (19 May 1901 – 23 July 1990) was a German chemist and Nazi war criminal, notably involved with the research of chemical nerve agents…. Beginning in 1926, Ambros worked at BASF in Ludwigshafen. In 1930 he spent a year studying in the Far East. From 1934 he worked at IG Farben, becoming head of their Schkopau plant in 1935. His division of IG Farben developed chemical weapons, including the nerve agents sarin (in 1938) and soman (in 1944). In this capacity, he was an advisor to Carl Krauch, a company executive. 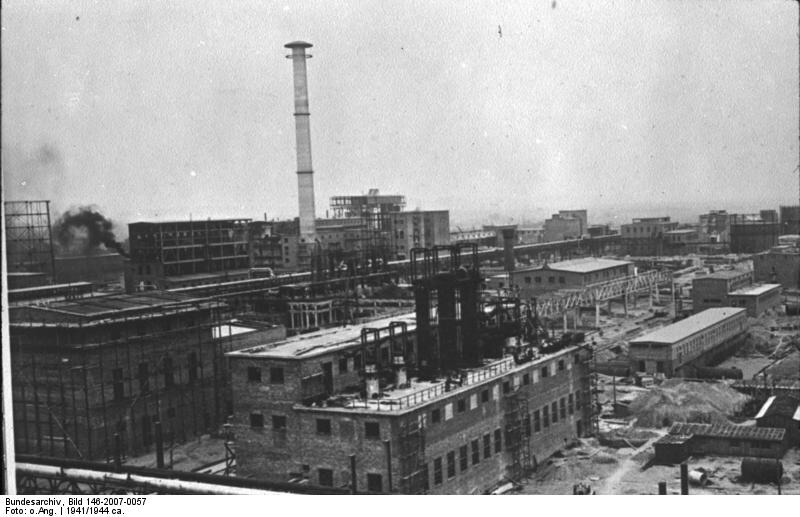 Ambros then managed the IG Farben factories at Dyhernfurth, which produced sarin and soman, and at Gendorf, which produced mustard gas, a skin irritant. In 1944 he was awarded the Knight’s Cross of War Merit Cross. He was an expert on tabun, an extremely lethal chemical. Ambros was arrested by the US Army in 1946. He had tested poisons and chemicals on concentration camp inmates, and had overseen the IG Buna Werke rubber plant at Auschwitz. At Nuremberg in 1948 he was sentenced to eight years confinement, and was ultimately released from Landsberg Prison early in 1952. Ambros got a light sentence considering his crimes and was let out early! 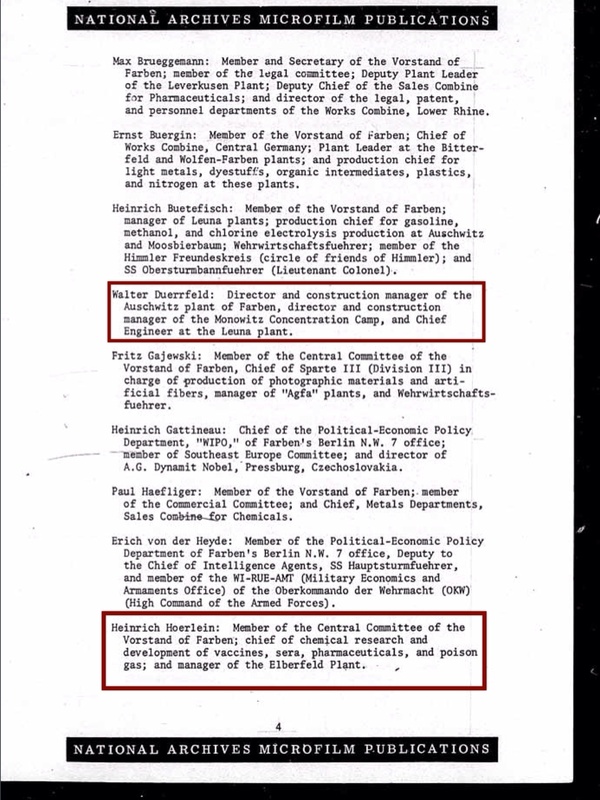 And, went on to advise for Dow Chemical and the US Army Chemical Corps! There is something strange here. Bayer is implicated in the development of chemical weapons. During WW1 Bayer was involved in the development and manufacture of a range of poisonous gasses used in the trenches, including chlorine gas and mustard gas. As part of IG Farben, Bayer were also involved in the development of the next generation of chemical warfare agents, toxic organophosphate compounds. Tabun was first examined for use as an insecticide in late 1936 in a program under the direction of Dr. Gerhard Schrader at the Bayer facility at Elberfeld/Wuppertal. An accidental exposure of Dr. Schrader and a laboratory assistant to Tabun vapors made it quite clear that this compound had potential military applications. Tabun was then mass produced by IG Farben during WWII although it was never used as a weapon. Schrader was also responsible for the discovery of related, but more toxic, nerve agents including Sarin and Soman. Whilst working on chemical weapons Schrader discovered the chemical compound E 605, the principle ingredient in the pesticide parathion. After the post-war dissolution of IG Farben, Schrader continued to develop pesticides for Bayer. After World War II, Bayer and other companies began to introduce a large number of organophosphorus compounds, including parathion, into the marketplace for insect control. The difficulty with organophosphates (OPs) is that they are neurotoxic due to their effects on acetycholinesterase, and unfortunately this enzyme occurs in humans as well as in insects. The links between chemicals developed as ‘pesticides’ with chemicals suitable for weapons has continued at Bayer. In 1989 it was revealed that Bayer hold a patent for a compound chemically identical to the VX gas used by the US military. The compound was discovered by Gerhard Schrader, and was patented in Germany in 1957, and in the US in 1961. Bayer claim that the compound was developed as a potential pesticide and that the US military application of the compound has nothing to do with them. Bayer head Carl Duisberg personally propagated the concept of forced labour during WW1. The company placed itself under a large burden of guilt due to its heavy involvement in the planning, preparation and implementation of both world wars. 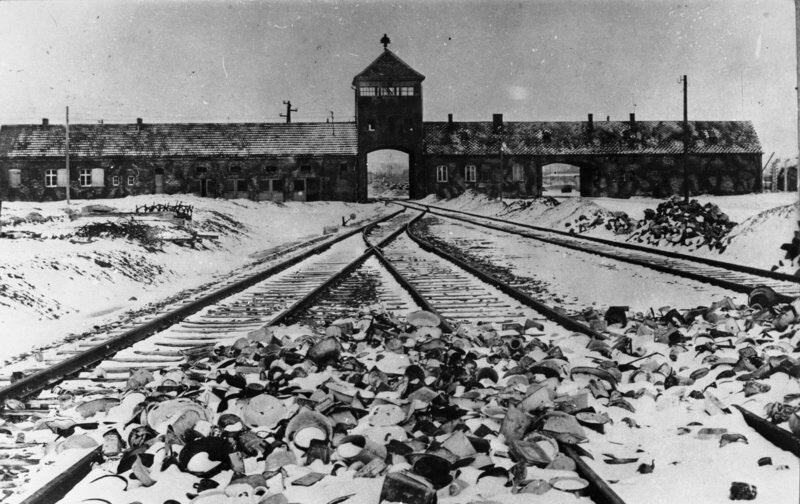 The International War Crimes Tribunal pronounced the company guilty for its share of responsibility in the war and the crimes of the Nazi dictatorship. 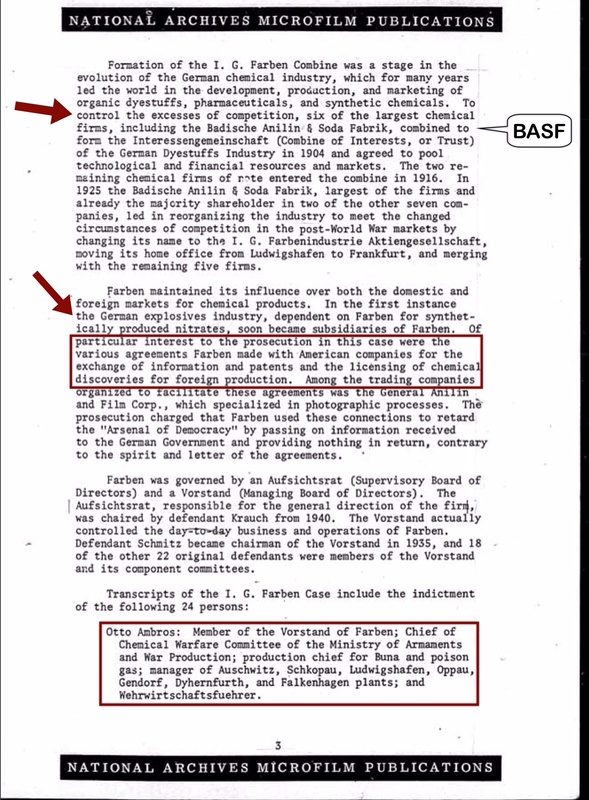 After the war, IG Farben separated into three giant corporations: Bayer, Hoechst and BASF. On 1 August 1963, Bayer celebrated its 100th anniversary at the Cologne fairgrounds. The opening speech was delivered by Dr. Fritz ter Meer, not only out of prison but – a convicted mass murderer -elevated to the position of Chairman of the Supervisory Board of Bayer. IG Farben also conducted experiments on humans. Eva Mozes Kor, among the 1,500 sets of twins experimented on by the infamous Dr. Josef Mengele, claims that IG Farben monitored and supervised medical experiments at the Nazi concentration camp where she was interned. She claims the experiments involved toxic chemicals that IG Farben (Bayer) provided. In some of the experiments, the lawsuit states, prisoners were injected with germs known to cause diseases, ‘to test the effectiveness of various drugs’ manufactured by IG Farben. Mengele conducted genetic experiments there in an effort to create a super race of blonde, blue-eyed Aryans who would be born in multiple births. Both Kor and her sister survived their 10-month ordeal in the concentration camp and were liberated by Soviet troops in January 1945. They were nearly 10 years old. 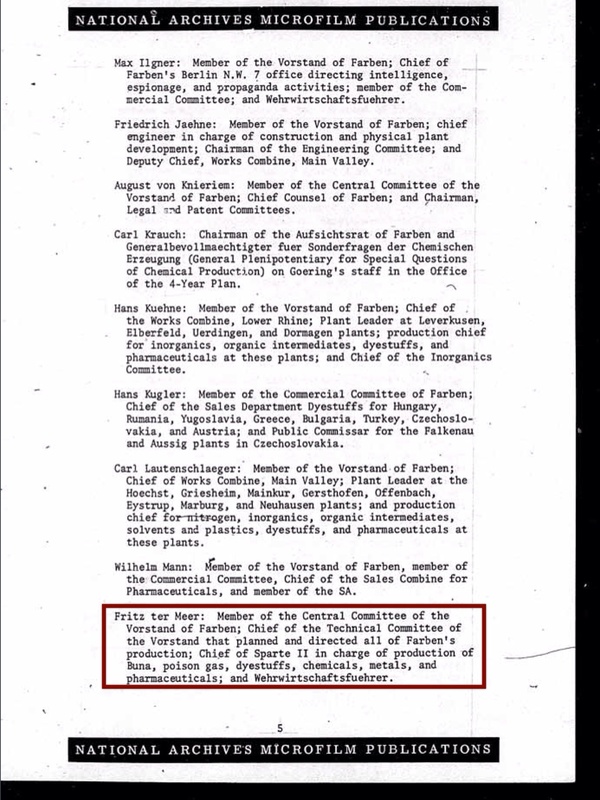 According to Irwin Levin (Kor’s Lawyer), IG Farben paid Nazi officials during World War II for access to those confined in the camps and collaborated in Nazi experiments as a form of research and development. The lawsuit sought unspecified punitive damages and the recovery of profits it maintains IG Farben (Bayer) earned as a result of such research. Eventually Eva Kor and various others were paid out of a fund put up by the German government and the companies. Bayer gave 100 million German Marks to the fund. The entire fund (totalling 10 billion German Marks) was a result of various American lawsuits – without the loss of reputation in the US the companies would never have agreed.